We witnessed a horrendous first half from Palmeiras, completely lacking offensive impetus: only minutes before halftime, a first shot at goal. Palmeiras went into the dressing room losing 1-0, Jackson having failed at clearing a corner, leaving it to Jean to stuff the net. Had it not been for Fluminense’s obvious weaknesses, it could have gotten very ugly. Coach Oliveira promoted Rafael Marques on Egídio in halftime, Zé Roberto as usual being dislocated to the left flank. Palmeiras improved significantly, but it looked like curtains as Cícero, on a rare venture into Palmeiras territory, expertly folded his knees as Fernando Prass slid towards him, the referee confirming the penalty. Fred stepped up to the spot. Had he made it 2-0, I guess Enderson Moreira would still be coaching Fluminense – as it happens, 40 minutes after he final whistle he received the boot, the carioca team now looking for their fourth coach this season. With renewed hope, Palmeiras went for it. Oliveira swapped Arouca for Allione and Alecsandro for Barrios, and in a matter of minutes Palmeiras equalized through the latter. Less than ten minutes later, Gabriel Jesus stole the ball from a Fluminense defender and blasted it passed Cavalieri. Fluminense fell to pieces. On stoppage time, Barrios bagged another two braces. The day before yesterday, Barrios rejoiced as he announced he had come to an agreement with Cleiton Xavier to swap numbers: Barrios has always preferred the 8, and Xavier agreed to let it go, taking the 10 instead. 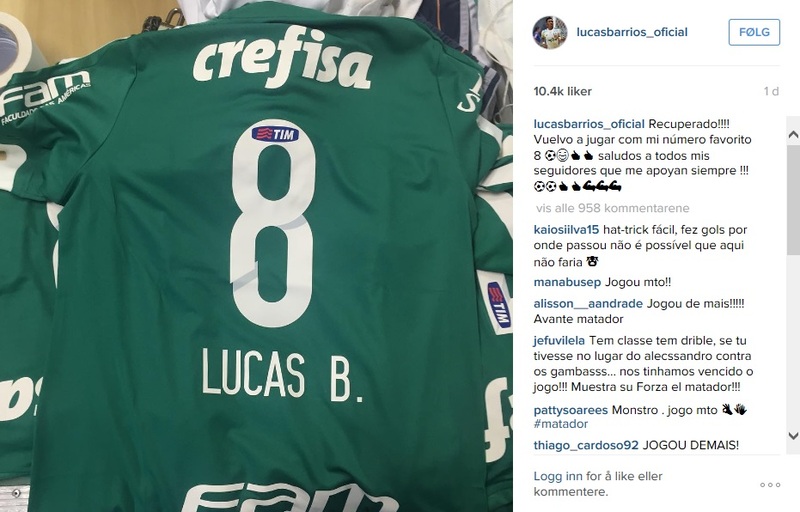 Immediate results: last time a foreigner scored a hattrick for Palmeiras was in 1969 – Argentine centre-forward Luis Artime, against Botafogo-SP. It has been eight long years since Palmeiras last beat Fluminense in Rio de Janeiro. Palmeiras, Flamengo and SPFC all have 41 points, our rivals however with one game less played. Depending on today’s results, Palmeiras are a draw from the G4. Not that we can afford thinking about anything but victories: that last spot in the G4 is within the reach of many, and particularly Flamengo and Santos are looking increasingly strong in form. Coach Oliveira needs to take a darn good look at his starting eleven and how the men are prepared. You cannot even compare Palmeiras’ first 45 minutes to the last 30, the difference is absurd. Oliveira must promote change, both to the line-up as well as psychologically speaking. Let’s see which Palmeiras come on against Grêmio on Saturday.